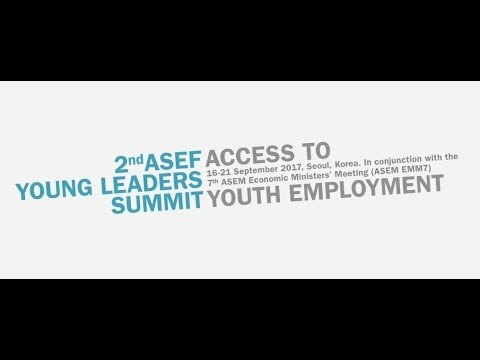 The 2nd edition of the ASEF Young Leaders Summit (#ASEFYLS2) is for young thinkers and doers to dismantle the conventional and to bring forward fresh ideas and solutions for a more inclusive, fair and accessible employment market for the youth. Themed “Access to Youth Employment”, ASEFYLS2 contributes to the implementation of the Sustainable Development Goals (SDGs), in particular goal 4 (on education), 5 (on gender equality), 8 (on decent work) and 9 (on industry and innovation). The project focuses on 8 thematic areas linked to job-creation and inclusion: 1) age, 2) education, 3) disability, 4) finance, 5) gender, 6) location, 7) social backgrounds and 8) technology. ASEFYLS2 is as an experiential space and networking hotspot where 150 young minds from 51 ASEM countries meet influential leaders from Asia and Europe. The programme is designed to nourish a constructive exchange of ideas and good practices, hands-on skills development and concludes with a Call for Action addressed to the ASEM Education Ministers. The ASEFYLS2 line-up of speakers, panellists and mentors includes top-tier policy makers, thought-provoking academics, daring entrepreneurs and civil society advocates. As a highlight of the summit, personal interactions between the youth participants and the ASEM Leaders/Delegations are also arranged during the event. Pssst! Want to get a feel of the previous ASEFYLS? With the upcoming election in Korea in May 2017, the host of the 6th ASEM Education Ministers' Meeting (ASEM ME6) has decided on a postponement of the Ministerial Meeting. To ensure the direct interaction between the ASEFYLS2 participants and the political leaders of 51 ASEM partner countries, we are now liaising with our Korean government partners on the postponement of the ASEFYLS2 - and its linkage to either the ASEM ME6 (November 2017) or the next ASEM Economic Ministers' Meeting (ASEM EMM; September 2017) in Seoul. The change in dates does not impact the selection of candidates, which is currently ongoing by the screening committee. We will announce the result to each applicant through email in the coming days. A big thank you to all applicants for your enthusiasm and patience! Do you want to create a more inclusive, fair and accessible employment market for young people? If yes, then apply now for the 2nd ASEF Young Leaders Summit (#ASEFYLS2) to shape the future. With an unprecedented number of young people entering the labour market, societies across Asia and Europe must adapt to equip young people with the education and skills necessary to have financial independence and a life of dignity. Themed “Access to Youth Employment”, ASEFYLS2 is for young thinkers and doers with passion and ideas to tackle this challenge. ASEFYLS2 will focus on 8 thematic areas linked to job-creation and inclusion: age; education; disability; finance; gender; location; social backgrounds; and technology. The project will also contribute to the implementation of the Sustainable Development Goals (SDGs), in particular goals 4 (on education), 5 (on gender equality), and 8 (on decent work). Costs? ASEFYLS2 has no registration or participation fee. The organisers will provide participants with transportation, travel subsidy, accommodation and meals. How to apply? Click here to apply for this rare and valuable opportunity!